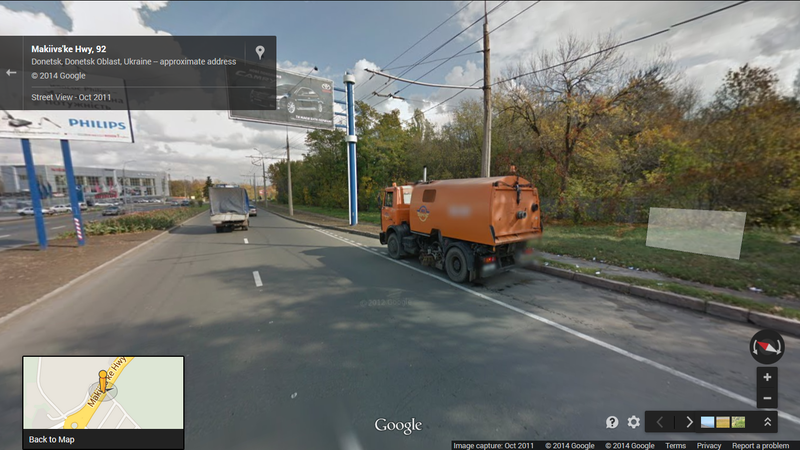 The construction company in Donetsk advertised on the truck panel. 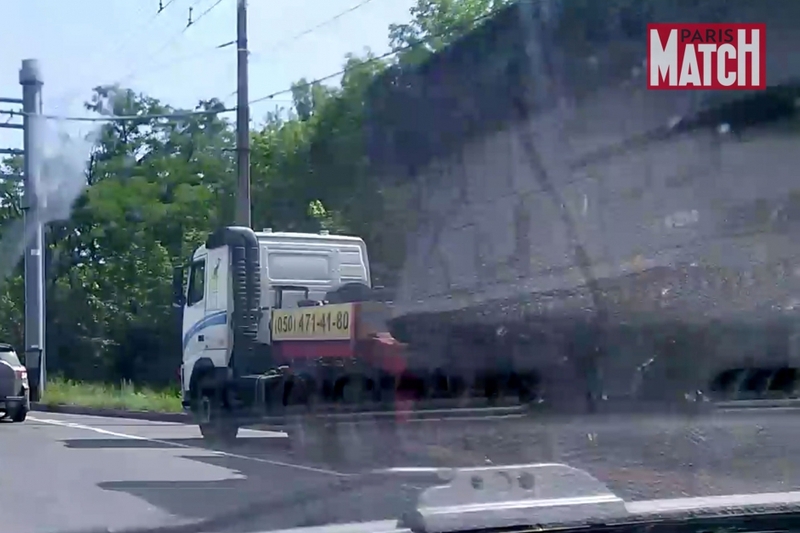 Now, this BUK and trailer may well be the same ones seen in the towns of Zuhres, Torez and Snizhne on the day of the crash, and which have been widely suggested as the probable launch vehicle. Paris-Match also included the infamous Lugansk video, which was published by the SBU (Ukrainian equivalent of the KGB) and which the SBU claimed was taken in Krasnodon, near the Russian border, when it was actually taken in Lugansk (at an unknown time) at an intersection and on a route which is not a logical route to Russia. I’d like to recommend another article by Alfred De Montesquiou relating to the situation in Ukraine. Paris Match have amended their article to confirm that the photo was taken in Donetsk. 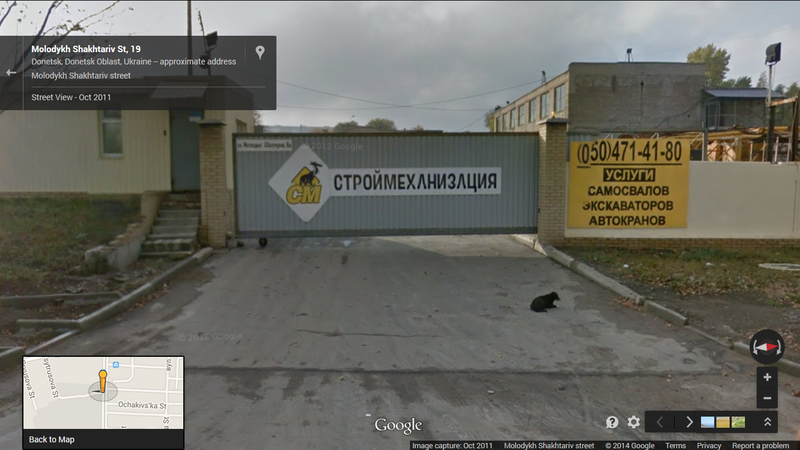 However, as of 29/07 they still have not corrected the Krasnodon location for the video. 1) Paris Match have said that their photographers took this vital photograph. 2) Paris Match say there was some kind of mix-up in locations accounting for them saying it was in Snizhne rather than Donetsk (75km away). 4) This is an incredible error to make in a matter of this seriousness, but these things do happen. 3) We have pointed out Paris Match’s error with regard to the SBU-provided “Krasnodon” clip – actually in Lugansk – but they still haven’t corrected it, saying this is because it was officially provided information. 4) We have asked Paris Match for a copy of the photograph to check EXIF data etc and will update everyone when we receive a response. Alfred De Montesquiou has told HRI that it was coincidence that the BUK was seen by Paris Match on that morning as lots of journalists were heading out towards Snizhne that day as there was fighting in the area. It is clear from this footage that the images were not photos but from a hand operated video camera. At the end of the footage the operator moves the camera down below the dash, as if not to alert any of the occupants of the convoy that they were being filmed. Last development by German expert yesterday is not Su-25 AAM R60 but it’s 30 mm anti- tank gun with explosive rounds used against MH17’s cockpit. High definition picture of one element of cockpit on the crash site, just under the pilot lateral window (starboard), show round holes which according to that expert are due to the 30 mm anti tank rounds, and the projectile that made those round holes went outwards (coming from port side), that explains the edges of that hole bent outwards. Hence the ” decompressive explosion” of the official narrative to distort the facts and try to explain the elements. Hence the desperate efforts of the Ukrainian military these days to access the crash site in order to plant “proofs” going the “right way”, regarding that narrative. Thank for the information Benoit. Have you got a link to that expert and a photo? The 30mm cannon claim is nonsense and the same goes for air-air-missile damage. The likes of R-60, R-73, R-27 air to air missiles use continuous rods. This is what 30mm cannon damage looks like. See following fragmentation warhead damage on an A-10 Thunderbolt II during Iraq 2003. 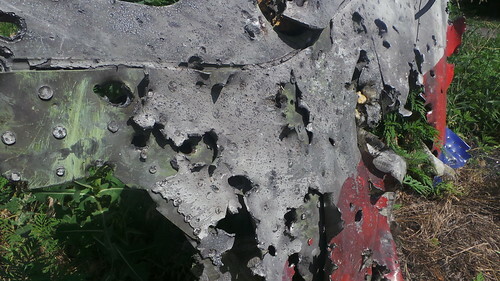 The damage on MH17 is consistent with what a fragmentation warhead does as in the case of the A-10. See following with higher resolution images. 1) the time I estimate might mean this photo was also taken a different day – compared to Torez photo, app. 11:40 AM (I concur with the Higgins crew on that), 11:15 is an impossible connection to make even if it started moving right after the photo. Too close to be sure though without a more careful check, but might be a clue. 2) The alleged SBU wiretap audio from right after the incident has the plotters talking about taking the BUK to just this spot after the roundabout, which is supposedly a major separatist checkpoint (see here.) This photo tries to show the truck resting just after passing through. The veracity of that recording needs challenged well now … the day too early claim did not pan out, so it won’t be that easy. Has anyone really done a good analysis tearing it apart some other way? Could it even be legit, with some local people tricked by some undercover (wire-wearing, not wire-tapping) supposed defector delivering it “with a team” coming “from Russia”? Who knows? Who knows, indeed. If you listen to the tapes (especially the first one), the scenario of “the perfect false flag” is still in play.